Chris and I first moved to the NYC area over 17 years ago. Early on, we had dinner one night at a little Italian restaurant just off of the hustle and bustle of Times Square. I still remember the dish I had that night, because I've spent the last 17 years trying to replicate it: Homemade farfalle pasta, plump tomatoes, fresh basil, a dollop of goat cheese and grind or two of cracked black pepper. It was smoky and bright, simple yet elegant -- and one of those dishes you think about for weeks. I tried to make it at home soon after, but it never tasted quite the same. But, about 12 years ago, I came close. Chris and I were prepping for our soon-to-be wedding, working late into the night gluing strawflowers onto the ceremony programs and painting the hair of the girl in our mini bride and groom cake toppers yellow, so she'd be a blonde and not a brunette. All 75 of them. We drank a couple bottles of wine as we worked, and by the time we were done, we were starving. All we had in the house was pasta so I grabbed some tomato sauce, goat cheese, and a few other ingredients and threw together a quick dinner in happy, exhausted, wine-induced daze. As we sat at our little table in our tiny kitchen, I remember stopping after the first bite. The handsome, amazing guy I was going to marry in a few weeks also stopped mid-bite: It tasted like the pasta from that little Italian restaurant. Jump head five more years, and I've stopped trying to replicate both the restaurant dish and the drunken pasta night dish -- I have no memory of the other ingredients I used that night. Still, every now and again I do make a tasty pasta dish with tomatoes and goat cheese, adding in new ingredients as the cookery spirit moves me. 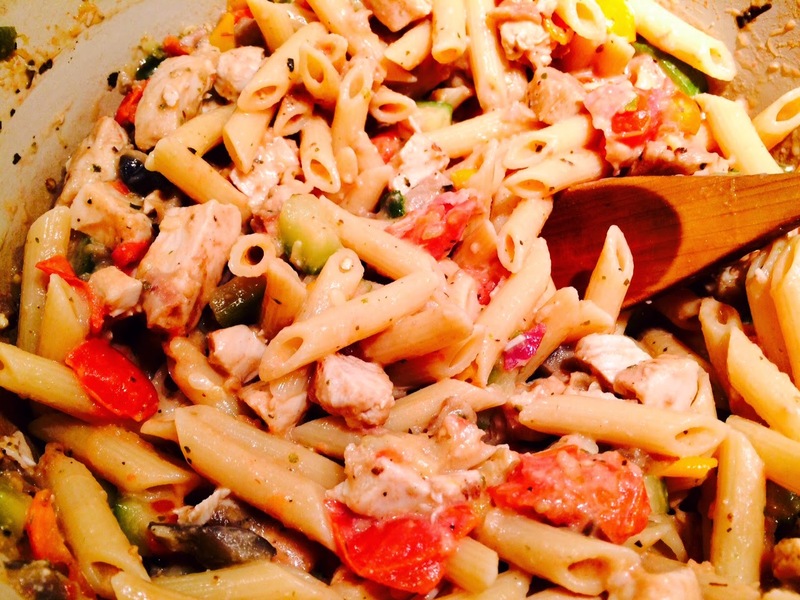 This time, I made a delicious pasta dish with penne, goat cheese, tomatoes, zucchini, bacon, garlic and herbs. Towards the end, I also stirred in some leftover chicken breast. It wasn't the same as either dish from years ago, but it was satisfying and comforting and good. And, I got to eat it across the table from the same handsome, amazing guy. Which is delicious in its own right. Boil penne in heavily salted water, until al dente. Drain pasta, reserving 1 cup of the cooking water, and set both pasta and reserved liquid aside. In a large pot or dutch oven, brown the bacon over medium-high heat until crispy, then add the minced garlic. Continue to cook, stirring often, until garlic is fragrant, then reduce heat to medium. Stir in the tomato paste until it coats the bacon and garlic. 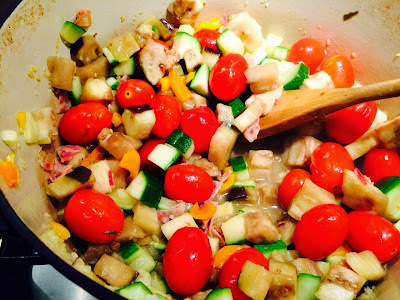 Add the diced zucchini, eggplant, the tomatoes, and the pasta water. Cover and cook until the veggies are tender and the tomatoes have started to burst, then stir in the goat cheese. Reduce the heat to low and simmer for a few minutes until the cheese has melted and liquid has thickened. Season to taste with salt and pepper, then stir in the herbs and chicken, then cook a few minutes more, until heated through. Scoop into bowls, top with more herbs and enjoy.